I covered this briefly in the following post Troubleshooting CDOT CIFS Server Create Failed “Strong(er) authentication required”. 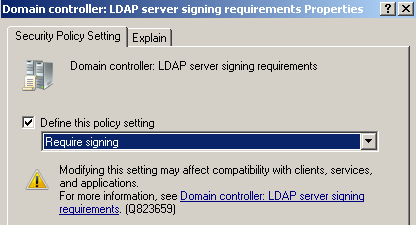 The following takes you through setting up LDAP over SSL from the server side of a Windows 2008 R2 SP1 Domain Controller. Note: It just happens to be the minimum required to force a NetApp CDOT 8.2.1 SVM to have to have LDAP over SSL properly configured before it can join the Active Directory Domain. My lab setup is simply a single Windows Server 2008 R2 SP1 Domain Controller - called MSDMC01 - in the domain LAB.PRIV. And we start with a pretty much out of the box Domain Controller setup. Close the ‘Group Policy Management Editor’ window. Close the ‘Group Policy Management’ window. Then, from the Domain Controller, open a DOS Command Prompt and type the following command to update the policy on the Domain Controller. Note: The GPO setting isn’t applied until the registry setting - HKLM\SYSTEM\CurrentControlSet\services\NTDS\Parameters and DWORD ‘ldapserverintegrity’ has changed from the default 1 to the new setting of 2. If you manually change in the registry without updating the Default Domain Controllers GPO, it will go back to 1 after every gpupdate. Note: Later on - but not required for what we want to achieve here - I will install ‘Certification Authority Web Enrollment’ so I can request certificates from the domain certification authority. 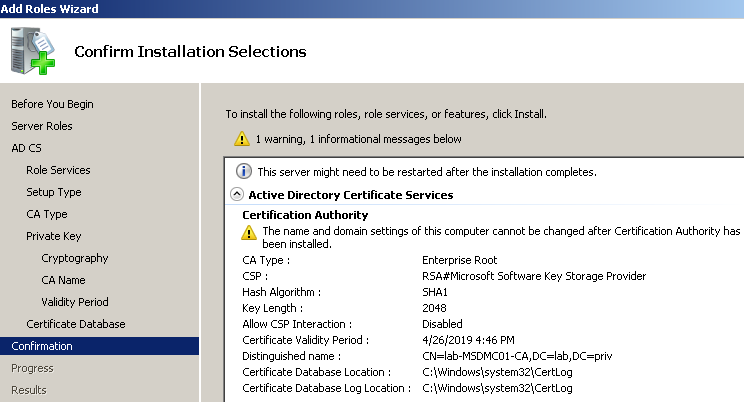 On our Enterprise Root CA Domain Controller, run the following commands from the DOS prompt (>) to obtain the self-signed root CA certificate, and copy all the output between and including the BEGIN CERTIFICATE and END CERTIFICATE lines into a simple text document. 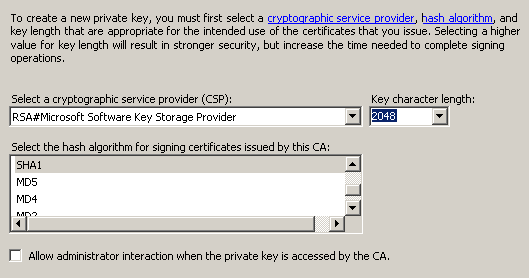 This will need to be provided to the clients wanting to establish LDAP over SSL connections, so they can install the root CA certificate first. CertUtil: -dump command completed successfully. CertUtil: -ca.cert command completed successfully.